CFMG Capital create value for investors through active and passive property investment in the residential, retail and commercial markets. The core focus for CFMG Capital is to create long term value for investors through disciplined acquisition and a conservative but realistic approach to investment. In a climate where real estate sector indicators across the nation point to a pick up in activity, spurred by low interest rates and a shortage of land supply it is anticipated that strong medium to long term earnings can be achieved through real estate backed investments. Residential Communities - We bring residential communities to life. The goal is to deliver aspirational addresses to emerging communities across Australia. Our ability to operate with agility, focus and quality delivers a clear competitive advantage to our brand. Real Estate Investment Trusts (REITs) - High quality real estate backed income stream investment opportunities including direct property, financial assets and opportunity funds. CrowdfundUP is pleased to present the CFMG Capital 'Lomandra Park' land subdivision for investment. CrowdfundUP is pleased to present the 'Elevate' land and opportunity fund, by CFMG capital. Two separate investment opportunities (Dalmatia Avenue and South Dalmatia Avenue), comprising of two parcels of adjoining land totalling 11.6 hectares amalgamated into the one project located 40km south west of the Sydney CBD. Developed and managed by CFMG Capital and completed in 2016, the project consisted of 210 residential lots with a gross realisation of $86.4M. Located 40km south of the Brisbane CBD and 30km from Surfers Paradise, this 32.6 hectare site was developed and managed by CFMG Capital and completed in 2017, comprising of 251 residential lots with a gross realisation of $52.2M. Located 35km west of the Melbourne CBD and in one of Australia's fastest growing corridors, this 17.3 hectare is being managed and developed by CFMG Capital with expected completion in 2019. CFMG Capital currently holds 220+ unconditional contracts with a gross value of $38.6M, with land title registration on 140 lots expected in 2018. CrowdfundUP invites it's Investors to invest in the North Oakland Pocket project, with property partner CFMG Capital. This 4.1 hectare site has been purchased with an existing development approval in place, and will be delivered as a single stage development of just 80 residential lots. 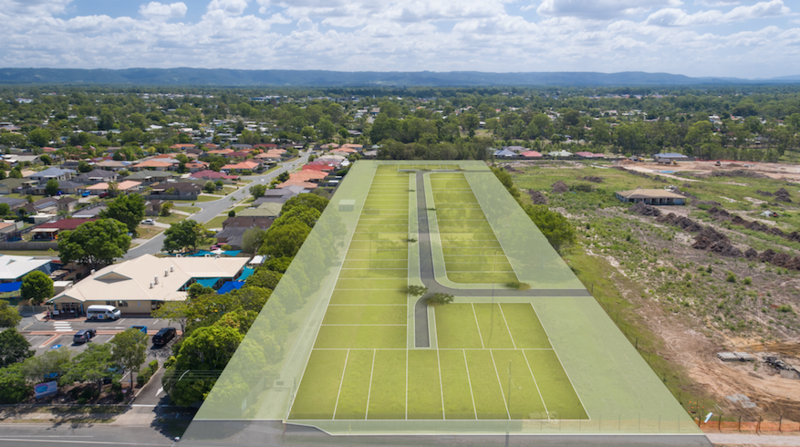 The development site is ideally located in the heart of Morayfield, a key urban growth corridor in Brisbane's North. The project relates to the offer of North Oakland Pocket Units which will have a beneficial interest in the securities issued by North Oakland Pocket Syndicate Limited to the Trust. With close to 15 years experience in management, marketing and strategy development, Andrew brings to CFMG Capital an in-depth understanding of property and financial services sectors through senior marketing and operations roles at AMP, Devine Limited and Ausbuild. With significant involvement in the sales, marketing and leasing of in excess of $2.5 billion worth of residential, retail and commercial property in Queensland, NSW, Victoria and South Australia, Andrew brings experience throughout project lifespan from acquisition to final settlements. Andrew has also worked in large organisations in specialist marketing positions such as Suncorp & Australian Insurance Holdings and holds a Bachelor of Business (Management) specialising in Marketing, Human Resource Management and Industrial Relations and has commenced a Masters Degree in Property Economics. Barrie has enjoyed his careers in the private sector and with the Commonwealth and State Governments. He commenced with the Shell Group of Companies in Brisbane then Sydney and Melbourne which culminated in his appointment as the South Pacific Audit Manager. Barrie then returned to Brisbane where he held a number of senior positions in the Corporate Affairs Office, including in 1989, his appointment as Director, Corporate Development and Operations. He was appointed as Queensland’s first Regional Commissioner of the Australian Securities and Investments Commission (ASIC) in January 1991 until March 2000. In January 2000, he was awarded the Public Service Medal for outstanding public service as Regional Commissioner in Queensland. Barrie has been an active member of CPA Australia and was a Director on the Board of CPA Australia for 3 years. Since leaving ASIC, he has held board positions on listed and unlisted public companies and not for profit companies. He continues to hold board positions. Barrie is the Chairman of three Compliance Committees and still chairs an Audit & Risk Committees. Barrie delivers presentations on Corporate Governance and Ethics and Risk Management, Directors’ Duties and Corporate Social Responsibility. During a career spanning more than 40 years, Ross has held a number of senior executive positions with a strong emphasis on the Financial Services sector, particularly with a Property and Real Estate background. In 1998, Ross was a founding partner and Managing Director of ASX top 200 company Cromwell Corporation Limited (ASX Code CMW), now known as Cromwell Property Group, and managed and directed the growth of the Company, now one of Australia’s largest Real Estate Investment Trusts with a market capitalisation of more than $1.7 billion as at 31 December 2016. Apart from his role of Managing Director at Cromwell, Ross was Compliance Director and Responsible Manager for the Managed Investment Schemes the company promoted. Since his retirement from Cromwell in 2008, Ross has maintained his interest in property and real estate, undertaking a number of residential and industrial land developments in his own right. Ross also maintains an interest in pre-fabricated housing manufacturer and builder, Arkistruct Pty Ltd, to whom he provides consulting and advisory services. Scott is a founding Director of both the residential communities development and income fund businesses of CFMG Capital. After five years as a solicitor in private practice advising a wide range of clients including State Government departments, publicly listed and private companies, Scott joined a private development and financial services group where his responsibilities included management of the group’s legal requirements and obligations, project management and broad acre acquisitions. From 2008, Scott has been actively involved in overseeing the governance and compliance obligations in relation to publicly syndicated land development companies. Scott holds Bachelor degrees in Law and Accountancy, a Graduate Diploma in Urban and Regional Planning and has more than 12 years broad experience in the property development and finance industries.